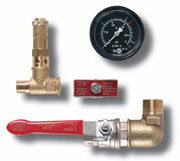 An air compressor regulator keeps your compressor running at peak efficiency. It regulates the flow of your compressed air output to help keep the air stream constant. This is important to nearly any compressed air application, but especially for those requiring a higher level of precision, like automobile detailing and dental surgery. Fitting your compressor with the right air compressor regulator increases the efficiency of your machine and can extend its life. A&W Compressor has been Tennessee’s one-stop-shop for quality, brand-name compressor parts and accessories for more than 25 years, and we are certain to have the air regulator you need for your compressor of nearly any size and power. Our experienced compressor specialists can help you put together a total compressed air system with the right air compressor regulators, filters, fittings, hoses, and other components to meet your individual needs. Call or e-mail A&W Compressor and Mechanical Service, Inc. today for more information on our selection of air regulators and more.